The reason behind his query: The Penang Global City Centre (PGCC) project. When completed, Penang will have another 33 high-rise towers each 40 storeys high on what was before a beautiful stretch of green lung. I was always wondered why the Penang Turf Club sold its prime asset, the 260-acre land at Jalan Batu Gantong that many consider "a veritable goldmine", for a mere RM488 million in 2002. Friends tell me the sale price works out to just over RM40psf, and even if we exclude a portion of the land that cannot be developed, the price is still low at just over RM60psf. With the land now rezoned for mixed development, it is now worth anything up to RM300psf. According to data I gleaned from a local website, it appears that the Penang state government's move to rezone the land began in November 2002. On Nov 25 that year, 78 per cent of the Penang Turf Club members, as vendors, voted at an extraordinary general meeting to sell the land to purchaser Abad Naluri. On Sept 12, 2007 Prime Minister Datuk Seri Abdullah Ahmad Badawi officially launched PGCC. An official launch, in the people's eyes, means official blessing. National news agency Bernama quoted the prime minister as saying at the launch that "Penang will emerge as a world-class regional logistics and services hub when the RM25 billion PGCC project in Batu Gantung is completed." My research shows that the land was alienated to the turf club in the 1930s. It was then zoned as open space, and only a minimal premium was paid. Subsequently, many attempts to change the use of the land to "mixed development" did not go down well with a large section of the public and as recently as this year, it encountered many protests during the island's 2007 Structure Plan exercise (as provided for under Section 9 of the Town and Country Planning Act 1976). Three days after PGCC's official launch on Sept 15, a group of concerned NGOs in Penang released a joint press statement opposing the development. This group consists of the Consumers' Association of Penang (CAP), Sahabat Alam Malaysia (SAM), Penang Heritage Trust (PHT), Malaysian Nature Society (MNS), Citizens for Public Transport (CEPAT) and Aliran Kesedaran Negara (Aliran). Among other things, the statement said the group "is shocked that the PGCC has been launched even before obtaining all major planning approvals. The government should not have granted fast-track status for the project, seeing that the scale of the development is going to create a drastic impact on the areas of traffic, social and environment on Penang Island." It then went on to say that several questions "about the manner in which the land was converted from 'open space' to 'mixed development', about traffic congestion, public consultation, and provision for social housing" have remained unanswered. The group then set out in explicit detail several "glaring issues" that needed to be answered by the relevant approval authority. On the issue of traffic congestion the NGOs asserted that the project is so large that it will affect almost every person in Penang, but there has been very little public consultation. On the absence of public consultation, they said that during the drawing up of the Penang Structure Plan "public consultation was minimal, perfunctory and the results were entirely ignored". The NGOs alleged that the mega project "was approved in Putrajaya", while plans "were finalised without any local input, and have now been publicly launched with much fanfare". Describing it as "a top-down planning of the worst type", the NGOs consider the entire exercise as going "against all principles of participatory democracy." I will not go so far and describe it in the same way, but to my mind it is certainly against everything that I have learned about "participatory planning". The expression "participatory planning" is a 2001 development of the old "principle of public engagement" that Malaysia declared it would uphold when it participated in the Earth Summit in Rio, Brazil, in 1992. On social housing, the six NGOs pointed out that national policy requires all development projects to include "30 per cent lowcost units", and yet "none will be built on the site". The developer, they claimed, intends to build 6,933 luxury apartments and houses, while the low-cost units will be built "elsewhere." In view of the the size of the project, the NGOs said, a detailed Environmental Impact Assessment (EIA) report should also be carried out. I agree with this, and would add a Social Impact Assessment (SIA) report as provided for under subsection (1A), Section 21A of the 1976 Act. I am told that a team of 60 architects, engineers and technicians from London, New York and Hong Kong have been working on the PGCC for the last four years, apart from a year the principal architect took to research Penang's "culture, history, social patterns and way of life" before actual designing work began. 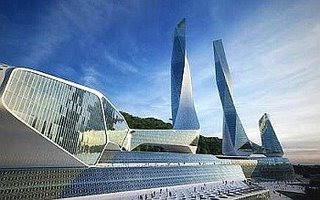 The architect was quoted as saying, "We have designed the buildings to blend with the surrounding hills and greenery ... they must fit into a carbon-free city scheme." Opposing this remark, another NGO, Penang Watch, asked, "How can 'zero carbon' be applied to a project that will cause so much social and environmental pollution and destruction". Are we, again, merely paying lip service to sustainable development? Will there ever be an end to more iconic towers in Penang Island?